no analogues, see nasal sprays and drops from allergies . recovery after surgery on the nose (to eliminate swelling of the nasal mucosa and sinuses). Also, the drug is prescribed to patients to prevent nasal congestion at night and to eliminate dryness of the nose and crusts caused by injuries. Before making applications with gel, you must thoroughly clean your nose. 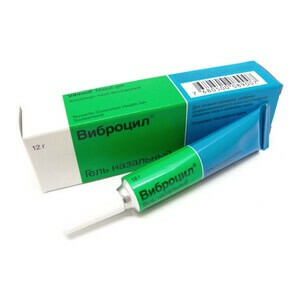 Children from 6 years and adults are shown applying a small amount of Vibrocil to the nostrils 3-4 times a day. 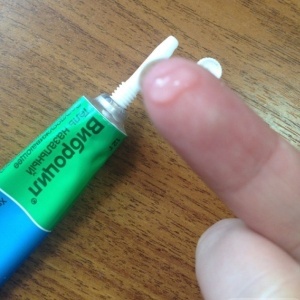 The gel should be injected as deeply as possible. The last use of the tool should be carried out immediately before bedtime - in this case, the effect of the drug will last until the morning. The duration of treatment depends on the severity of the symptoms. The maximum course of treatment is 1 week. Then you need to take a break. Intolerance to any components in the gel. Atrophic rhinitis (including an ozone, in which the discharge acquires a fetid odor). Acceptance of MAO inhibitors (simultaneously with Vibrocil or within two weeks before the start of treatment with this agent). hypersensitivity to the action of sympathomimetics (insomnia, dizziness, etc.). During periods of pregnancy and lactation, women should avoid using Vibrocil. The gel contains phenylephrine, which is able to have a systemic vasoconstrictor effect. The manufacturer claims that even as a result of accidental ingestion of means by young children, no serious complications were identified. Symptoms of overdose were absent in most cases. Occasionally, pain in the stomach, increased pressure, psychomotor agitation and sleep disturbances, weakness, and blanching of the skin were observed. When these symptoms appear, you need to give the person activated charcoal and a laxative. A child over 6 years old and an adult can also be drunk with plenty of water. Flush the stomach is not necessary. There is no specific antidote. Vibrocil virtually causes no side effects. Sometimes there is a mild burning or dryness of the nasal mucosa. Symptoms disappear after discontinuation of treatment. 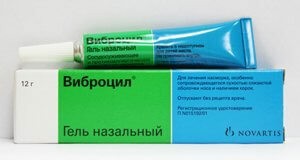 The drug is available in the form of a nasal gel. It looks colorless or slightly yellowish, has a light lavender scent. 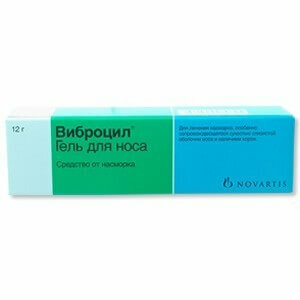 Vibrocil is a class of sympathomimetic drugs. The action of the drug is based on the properties of the two active substances in its composition. Phenylephrine stimulates alpha1-adrenergic receptors, thereby achieving a vasoconstrictive effect. As a result, swelling of the nasal mucosa and paranasal sinuses is reduced and nasal passages are cleared. The functionality of the shimmering epithelium and mucous is not disturbed. Dimethinden acts as an antagonist of histamine H1 receptors and has antiallergic effect. It is well tolerated by most patients and shows efficacy when using small doses. The place inaccessible to children, the optimum temperature is up to +30 degrees.